Cheshire Oaks opened in March 1995 and with 140 stores, is McArthurGlen’s largest designer outlets in the UK. There are lots of designer and high street brands like Diesel, Karen Millen, Polo Ralph Lauren, Tommy Hilfiger, Ted Baker at up to 60% discount, however it seems to lack the exclusive Italian and French designer label names. The historic Roman town of Chester, south of the Outlet, is a great place to visit and the Chester Market provides shoppers with undercover shopping in the heart of the city. There are up to 100 stalls offering a wide choice of finest quality produce like cheeses and cooked meats and clothing, footwear and gift shops. Chester Zoo is the UK’s largest and most beautiful zoo and the Blue Planet is UK’s largest aquarium. Head north and you have the city of Liverpool, Beatles country. 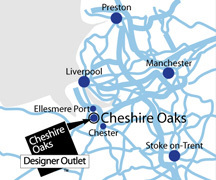 Cheshire Oaks is located just off Junction 10 of the M53 motorway, in Ellesmere Port, with first class road and rail links. Find them via SAT Nav by simply inserting CH65 9JJ. First Bus run services that go via Cheshire Oaks Designer Outlet. – The No. 1 bus runs between Chester and Liverpool, Monday to Saturday and a limited service on Sunday. – The No. 36 and the No. 111 also run via the Outlet. Contact First Bus for more details. Tel: +44 (0) 1782 592500, Customer Services +44 (0) 8708 500 868. – Regular services operated by Merseyrail run between Liverpool Central and Ellesmere Port. – From Chester Railway Station catch the No. 4 bus. For times and fares see Merseyrail.org. For National Rail enquiries, Telephone +44 (0) 8457 48 49 50. Leave the M53 at Junction 10 and follow the signs to the ‘Outlet Village’. Cheshire Oaks Designer Outlet offers 3,200 free parking spaces. Sun 10:00* – 17:00am *Larger shops will open at 11am.